One Sweet Ride: When a journey to Island Lake Lodge becomes the destination. Not long ago, someone I know announced that he loves everything about travel except, that is, travel itself. I understand what he’s saying. Getting around on this planet isn’t always pleasant, especially when you’re stuck on a runway, squished like a sardine into an oxygen-deprived plane. On the other hand, when the journey holds as much appeal as the destination, the story changes. “Hop in!” our sunny-faced, toque-clad driver announces as my daughter and I climb into one of the most Canadian means of transport we’ve ever experienced. Warm and secure in the confines of a fire-engine-red snow cat, we begin our climb towards the Lizard Mountain range in southeastern British Columbia. Beaming, we crawl past towering cedar trees heavy with snow. Our vehicle, designed for terrain exactly like this, hugs the frozen earth as we go. We’re en route through a temperate rainforest to Island Lake Lodge, located near Fernie and best known as a powder hound’s cat skiing dream operation. But the lodge has also crafted a day trip option for guests (which is why we’re here) during winter. Nordic skis and snowshoes are available, too, for guests inclined to explore surrounding trails. My daughter and I have just wrapped up a thrilling but exhausting week of winter sports in the region, so we choose to remain indoors and enjoy the coziness of lodge life. 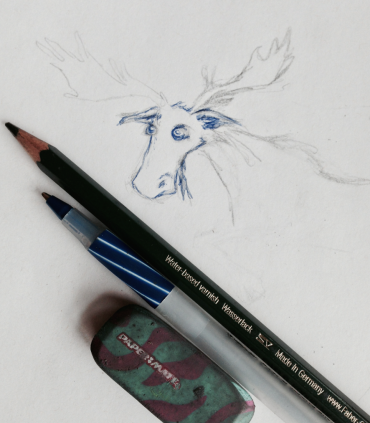 We also sit in the dining room by the window with our notebooks, where my daughter sketches a delightful, cartoonish moose, marking the occasion. And we bask in breath-catching vistas of the surrounding wilderness. When it’s time to call it a day, the feeling is bittersweet. Leaving mountains behind is never easy. In this case, though, it isn’t over until it’s over. Our trusty red snow cat swings by the lodge’s front door, we jump in and we’re off — back down the mountain and through an icy winter wonderland to the parking lot below. Reflecting on this unique day trip, equal parts journey and destination, still brings a warm glow to my face. Editor’s Note: This post was produced as the result of an arms-length collaboration with Island Lake Lodge. For more information about the lodge’s winter lunch invitation, which runs Dec 15 through April 2, click here or call the reservation line at 250.423.3700.